-Read the excerpt below from the an article by John Nolte. 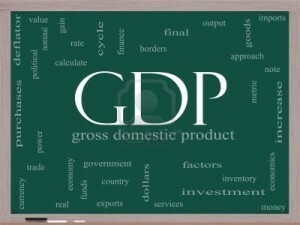 The Bureau of Economic Analysis released its Gross Domestic Product (GDP) estimate for the second quarter of 2013 on July 31st. Though it will surely be revised up or down in the coming months, the number is 1.7%. In the first quarter of this year the GDP was 1.1%, revised down from initial estimates that were as high as 2.5%. The last quarter of 2012 saw the GDP grow only 0.1%. The result of today’s GDP announcement has resulted in almost uniformly positive headlines. Here are four things the media are not telling you. 1. GDP Growth of 1.7% Stinks —In order to artificially prop up President Obama, the media have created what I call “The Obama Curve.” In order to make his failed economic recovery look good, the media have – for the first time in my lifetime – [changed] what was once considered acceptable job and GDP growth to practically zero. Just one example is this headline from 2002, wherein the New York Times expressed disappointment over an unemployment rate that dropped from 5.9% to 5.7% under Bush. The same is true of today’s 1.7% GDP. Historically, not only is that a standalone terrible number that shows our economy is hardly growing at all; it is especially dismal when we’re supposed to be coming out of a recession. …You need only go back two years into Obama’s own term to understand how awful 1.7% is. For four quarters, between the second quarter of 2011 through the first quarter of 2012, the quarterly GDP reached 3.2%, 1.4%, 4.9%, and 3.7%. When you are coming out of a recession, those are not great numbers, but they are at least acceptable. Since then, however, the bottom has fallen out. The media won’t, though, even look at or compare today’s numbers to Obama’s own track record for fear it might turn into negative news [stories]. This chart does not include today’s numbers, but 1.7% would do next to nothing to improve that 0.73% number. Here is an important point for those who will argue President Obama is not responsible for the recession he inherited: Even if 2008 (-0.3%) and 2009’s (-3.1%) negative annual GDP percentages are dropped (something undone for the other periods) and only the 2010-13 period is averaged, the result is just 1.95% – still over a full percentage point below the previous decade’s. 4. Reagan Also Inherited a Dead Economy and We Roared Out of That Recession – [The media continues to push the idea that] President Obama inherited the worst economy since the Great Depression. This rhetorical trick is used to excuse the President’s dismal “recovery.” The truth is that when Republican President Ronald Reagan assumed office in 1981, the economy he inherited was in many ways worse. Unemployment, inflation, and interest rates were higher, and after a decade of stagnation, the American people had lost hope. If anything, these inherited recessions are only separated by two months. Reagan dealt with a 16-month recession, Obama an 18-month. The approach Reagan and Obama took towards their economic inherited disasters are case studies in polar opposites. Reagan cut taxes across the board, cut regulations, and in general got government out of the way of the American people’s ingenuity. Obama, on the other hand, micro-managed the economy with his failed $800 billion stimulus, passed onerous regulations like Dodd Frank and ObamaCare, and never stopped hurling rhetoric about raising taxes and increasing regulations. The results have been as polar opposite as the approach. The economy boomed under Reagan. There were months when close to a million private sector jobs were created. But since we’re talking about the GDP, let’s stick to that. The economy during President Reagan’s second term exhibited steady economic growth with a 3.7 percent annual average. The GDP growth rates for the years 1985 to 1988 were 4.1 percent, 3.5 percent, 3.2 percent and 4.1 percent. Quarterly growth rates ranged from a low of 1.6 percent to a high of 7 percent. Of the 16 calendar quarters during the four-year period, nine quarters had GDP growth between 3.1 and 5.5 percent. Because of President Obama’s poor economic philosophy and policies, we are suffering (needlessly) through the worst “recovery” in history. To cover this fact up, the American media remove all context from their reporting and have created The Obama Curve. Only through the use of propaganda can the media claim that 1.7% is anything other than devastating for the millions of Americans entering their fifth year of job growth that doesn’t keep up with population growth, falling wages, and a GDP going the wrong way. The worst part of this is that The Obama Curve perpetuates this misery because no media pressure is put on the president to do better. 1. What type of bias does Mr. Nolte imply the media exhibits in reporting on the economy under President Obama? 2. Mr. Nolte asserts: “Because of President Obama’s poor economic philosophy and policies, we are suffering (needlessly) through the worst “recovery” in history. To cover this fact up, the American media remove all context from their reporting and have created The Obama Curve.” Do you think Mr. Nolte successfully backs up this assertion with his statistics? Explain your answer. 3. Mr. Nolte states: “Only through the use of propaganda can the media claim that 1.7% is anything other than devastating for the millions of Americans entering their fifth year of job growth that doesn’t keep up with population growth, falling wages, and a GDP going the wrong way.” Do you agree with this statement? Explain your answer. 1. Mr. Nolte illustrates bias by SPIN.